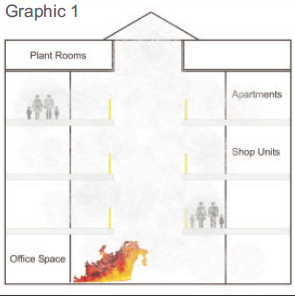 Smoke is the greatest threat to life safety in a fire situation, graphics 1 and 2 indicate one of the many problems smoke can cause in large buildings. Graphic 1 shows a typical Multi Storey Shopping Mall with a Central Atrium. In the event of a fire at a lower level, smoke will rise and enter the upper floors. This smoke will reduce visibility and cause occupants to be disorientated, and could result in deaths. By using Automatic Fire protective Smoke Curtains with Smoke Ventilators and fresh air intake it is possible to ensure that the unaffected floors are protected. 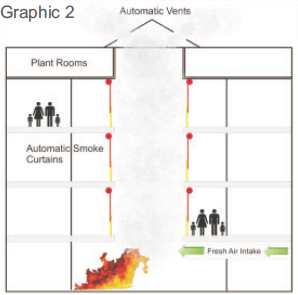 In Graphic 2 you can see the result of installing an automatic smoke fire control system. The smoke detections system would activate and the Automatic Fire protective Smoke Curtain system would be deployed on all floors with the exception of the floor on which the fire has been detected. In turn the smoke extraction system would operate. Smoke is restricted to the fire floor leaving the remainder of the building free from smoke allowing safe egress for the occupants. Fire compartmentation is a requirement of Building Regulations, access routes through fire compartment walls need to be protected to provide the required fire integrity. A cost effective solution is to install Automatic Fire protective Smoke Curtains which are a lightweight compact and convenient alternative to fire shutters. Upon activation of the fire alarm system the fire protective curtain would descend and a compartment with a fire rating of 4 hours would be created. 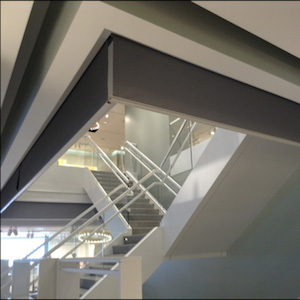 Fire protective curtains can be manufactured to various widths using single or multiple roller systems.